already provided safe and loving new homes for our animals. Prices are negotiable, good homes are not. You will be pleasantly surprised at their pricing. on-farm. The informal atmosphere provides a chance to renew friendships with past clients and make new acquaintances. Many of our customers are repeat buyers and have become good friends. The sale is not conducted as an auction, so you can spend your time with the alpacas and buy with confidence. Comprehensive details are available on each alpaca, including full health and breeding history, micron and fleece weights if shorn, and show results if applicable. All breeding stock come with a fertility guarantee. There is no obligation to purchase and our advice is free. Our alpaca stud has been operating since 1994 so you can be assured that we will still be here if you need to ask for assistance in the future. 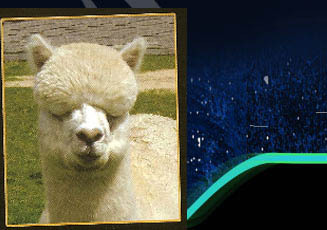 In addition to the annual sale, Starwood has a full selection of alpacas for sale throughout the year. Approximately twenty alpacas are currently available for sale. Many of the females are pregnant or have the option to include a free service. Peruvian genetics feature in many of the pedigrees and bloodlines include ILR Pperuvian Allin Capac, ILR Pperuvian Cordero, Cedar House Jacomo, Shanbrooke Casanova, Kaloma Maitake and our great favourites from Purrumbete Stud- Highlander, Ledgers Dream and El Dorado. Pets and wethers are available from $300, show and breeding stock are also realistically priced from $800. We can supply a mini herd (or larger if you desire) including pregnant females with an unrealated stud male, so you can enjoy the pleasure of birthing and growing out your very own crias. We strive to match buyers requirements and budgets with suitable animals. If we don't have what you are seeking we can direct you to fellow breeders who may be able to assist with your needs.